Defence Minister Nirmala Sitharaman on Friday, April 12, condemned the circulation of a letter written to President Ram Nath Kovind by veterans of the armed forces expressing displeasure over politicisation of the services, saying two senior officers whose names are mentioned in the letter have denied signing it. 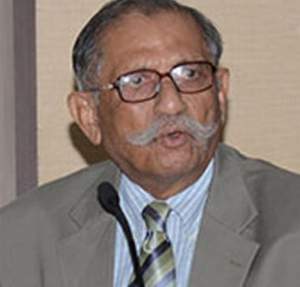 The letter in question was purportedly written by a group of retired officers of the army, navy and air force to the President, the supreme commander of the armed forces, urging him to urgently direct all political parties to stop using the services to further their political agenda. The 156 signatories include eight former service chiefs. General Shankar Roy Chowdhury (retd), a former Indian Army chief and one of the signatories, says he was certainly in the loop on the decision to write to Rashtrapati Bhavan about the politicisation of the armed forces, agrees with the tone of the letter, and says he consented to his name being appended. "We are indignant and annoyed that the good name of the defence forces is being used in a political context. It reflects on our izzat and we don't like it," the general told Rediff.com's Swarupa Dutt. Three of the veterans whose names are appended in the letter sent to Rashtrapati Bhavan have denied signing it. In fact, one of them, General S F Rodrigues, has said it's a classic case of fake news. I don't know about that. But I spoke to some of my friends and they said this politicisation of the armed forces is a bit too much, and I said, yes, it is and what are you going to do about it? And they said, 'let's write to the President'. So, I said in that case, sign me up. I was sitting in Kolkata, so I'm not a signatory to a letter composed in Delhi, but I knew it was to be written and what its contents were and I gave my consent to my name being tagged on to it. Who is the brainchild behind the letter? An admiral who is a friend of ours. I will not name him, but his name is there in the letter. Veterans have always been apolitical. Always. And we did not like how the army's name was being misused and the air force's deeds were being doubted by a certain section of the political leadership depending upon their convenience. So someone said, there is nobody else to write to, let's write to the President if he can get them (political parties and politicians) to exercise some restraint. Rashtrapati Bhavan has denied receiving the letter. Must be. But I know it's gone to the President and I agree with the tone of the letter. Isn't this unprecedented? Do you ever remember the armed forces having to resort to something like this? During service, they can't obviously. After leaving the service a letter on these lines was written about during the One Rank One Pension issue. This letter is not a complaint, it's more indignation, because we do not like being used as political tools by people of various parties. But this is not unprecedented in two senses -- firstly, OROP, and secondly, in 1971, when we had defeated the Pakistanis and created Bangladesh there was a slogan at the time, 'Indira is India and India is Indira' coined and put into circulation by Dev Kanta Barooah of the Congress. This has been happening under all governments, if there is an occasion or event that is a feel-good factor, the government uses it. This government (the Bharatiya Janata Party-led National Democratic Alliance) feels good about the Balakot air strikes and used it. Don't forget, during the 1965 War, 'Jai Jawan, Jai Kisan' was launched. The political system has always been like that. Has this discontent with the politicisation of the armed forces been brewing for a long time? I wouldn't say discontent, it's more like indignation that the good name of the defence forces is being used in a political context. That's unacceptable to all of us and we are annoyed about it. To use a very old fashioned word, it reflects on our izzat and we don't like that. In your letter you say this is an unusual and completely unacceptable practice of political leaders taking credit for military operations. What is the normal practice when cross-border strikes take place, for instance? The normal practice is you win your war and you get on with it. Who should take the credit for the Balakot air strike? The military credit should go to the Indian Air Force. The government in office makes the decision to go in for an air strike, so a share of the credit goes to them also. In this case, not to fly the aircraft, but to go across the Line of Control, enter Pakistani air space and destroy the Jaish-e-Mohammed installation. The credit for carrying it out goes to the air force, the credit for taking the decision to carry it out goes to the government of the time. During the India-Pakistan War (1971) the credit for enabling the creation of Bangladesh should go to the government. The debacle that was 1962 (the India-China War), the discredit for defeat, goes to the government at the time -- Pandit Nehru's government. 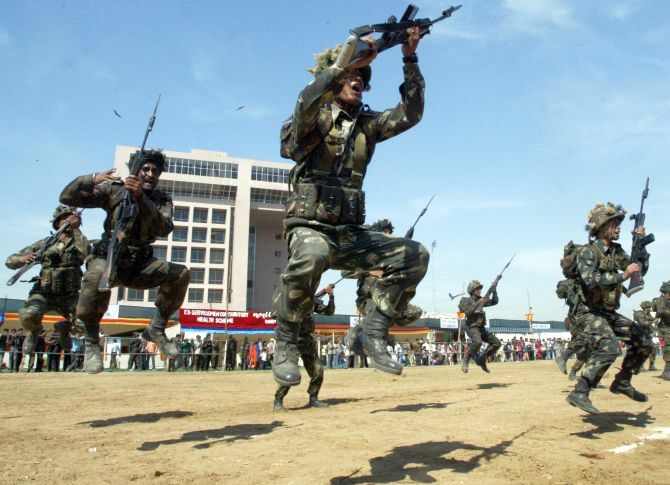 The letter states that the politicisation of the armed forces would adversely impinge the morale and fighting efficiency of the serving man or woman in uniform. How so? Well, the fighting efficiency would not be adversely affected, but the man or woman in uniform would certainly say or think, 'What the hell is going on'! They know the armed forces are totally apolitical and they would certainly be uneasy and wonder if things are changing. That could affect them. Army chief General Bipin Rawat has made political statements in the past that Badruddin Ajmal's All India United Democratic Front has grown faster than the BJP to buttress his point about influx of Bangladeshis into the north east. He was never pulled up for this. I will not comment on an army chief. Is there any message you would like to send out? The message is this: The army serves the government of the day. That is its mandate, that is practice and that's how it functions. It functions on directives of the government of the day and it is totally apolitical and totally loyal and patriotic to the nation.